Kevin McMullen (left), Brian Sarnacki and Rebecca Ankenbrand are among the inaugural Digital Scholarship Incubator Fellows at UNL. UNL Libraries and the Center for Digital Research in the Humanities have announced the creation of the Digital Scholarship Incubator -- a space to support and promote the development of UNL student-led digital humanities research and scholarship – and its first group of student fellows. As the university continues to build its reputation as an international leader in digital humanities, it also is investing in student success in the field that is beyond the classroom, said Elizabeth Lorang, digital humanities projects librarian and director of the incubator. That’s where the incubator, located in Love Library, comes in. It provides research consultations, coaching and support, access to resources, co-working space and project and professional development funding for students. The inaugural DSI Fellows – Rebecca Ankenbrand, Geraldine Dobos, Kevin McMullen and Brian Sarnacki – are developing projects that include electronic scholarly editions of literary and historic materials; network analyses and visualizations; and 3-D reconstructions of archaeological finds. Ankenbrand's project is a digital edition of the writings of Marie-André Duplessis de Sainte-Hélène (1687-1760), a nun who wrote the first published book by a French-Canadian woman, and Marie-Catherine Homassel Hecquet (1686-1764), who shared a childhood with Duplessis in Paris. In addition to recovering the voices of these women, Ankenbrand's work will set the stage for a larger project dealing with women writers in the colonial French world. Dobos's project is the 3-D reconstruction of the newly excavated Northeast Temple at Antiochia ad Cragum. 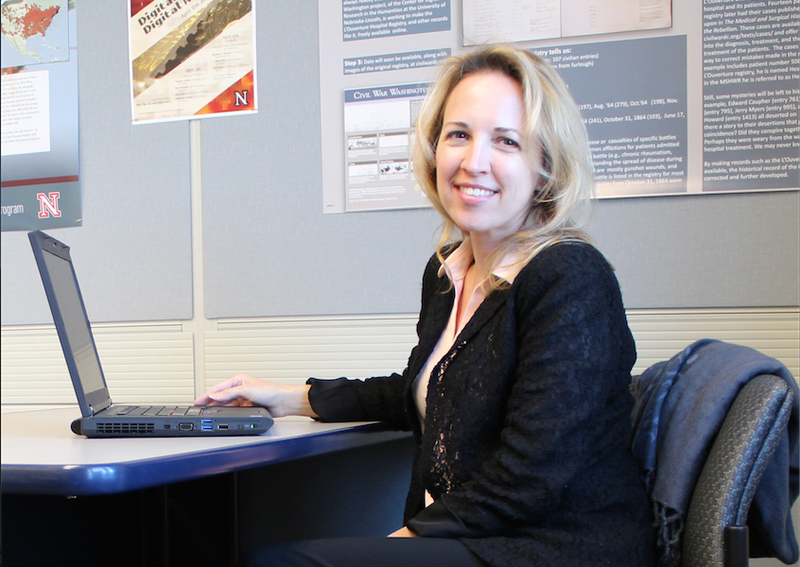 Dobos's virtual 3-D models of the Northeast Temple will complement the textual description of the temple she is completing for her master's thesis. In the incubator period, Dobos will digitize existing drawings and illustrations and create new virtual models that will provide a variety of possibilities for visualizing the restored temple. Her project also will help shape larger conversations in her field about how scholars share and publish their work. McMullen is completing an electronic scholarly edition for his incubator project. McMullen's work aims to change fundamentally how scholars of American literature have viewed the nineteenth-century author Fanny Fern. Fern was the highest-paid newspaper columnist in the country with her weekly column in the New York Ledger. Even so, her journalism has never been comprehensively edited, and selections of her work in print paint a distorted picture of Fern’s journalistic persona. Sarnacki's project has grown out of and will contribute to his dissertation, "The Rise and Fall of the American Small City: Industrialization and Urbanization in Cities Outside the Metropolis, 1870-1930." Sarnacki will develop digital mapping, social network analysis and textual analysis resources to bring to life everyday records, including shipping orders, letter books, payrolls, and membership rosters, of the businesses and cities he studies. During the fellowship period, students commit to developing a specific contribution to humanities scholarship that depends on digital methodologies for research and/or publication. Students might use the incubator to kickstart a new research project or to complete an ongoing project or stage of an ongoing project. Incubator fellows will work in the incubator space in Love Library for a minimum of three to five hours per week during the academic year. Fellows also support the research of other incubator fellows through thoughtful dialogue, critical engagement and knowledge exchange. Fellows also will present their work to the public and participate in training opportunities. Geraldine Dobos' project is the 3-D reconstruction of the newly excavated Northeast Temple at Antiochia ad Cragum.